I encourage someone to run that is for transparency. As we saw today at the working session, a leak of a secret document has parents livid about cutting fine arts. As the lady who testified, studies for decades have shown that fine arts education combined with regular subjects increases test scores in those regular courses. Fine arts education works. But besides the obvious, this constant behind the scenes planning and scheming is NOT working. I still am highly skeptical that 85% of people voted for the school bond. It’s just not plausible. But when you go about these things by gaming the system (votes were hand counted by mostly finance staff of the SFSD) you get what you want at the expense of others. 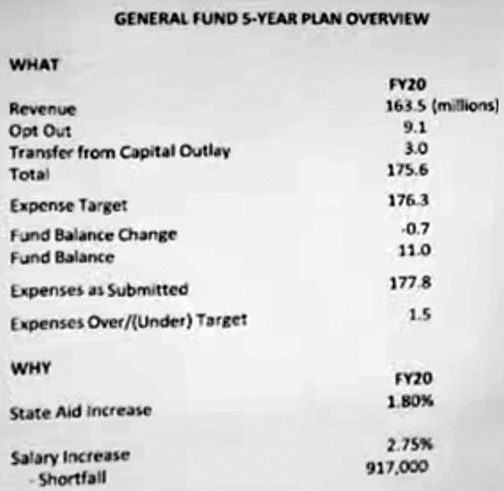 Today we found out that the school district is essentially broke. After tapping the taxpayers for several op outs and now probably around $400 million in debt they still have to cut programming. How does this happen? My simple guess is that when you run a government agency, like the SFSD, behind closed doors you have a select group of people making decisions without the input of parents, voters, taxpayers and even teachers. Open government SAVES money and helps to implement the best policies and practices. I often wonder when government officials in our city, county and state are going to figure this out instead of just begging us for more money due to their lack of open and transparent planning. Pathetic. While watching Monday’s SF School Board meeting I just about fell out of my chair. Member Reiter actually voted against the Dual Immersion program because she felt it needed more studying before implementing it. If you think the SF City Council is a bunch of rubber stampers, you should see the school board. They vote consistently YES on everything. And if there is any NO votes it is usually just one member, so it really doesn’t matter. There is also very little dissent in the discussion. Councilor Rick Kiley would fit right in because everything is always rosy and great. The public testimony on dual immersion was also interesting. A mother of Hispanic decent who had kids in the school district felt it was an important program to implement so her children (I assume who were born in America and speak English) could speak better Spanish. She told the board that while she could try to teach her children the language she felt she didn’t have the professional experience as a Spanish teacher would to teach them properly. An argument I wasn’t expecting. Several parents spoke, but nobody talked about the advantage of Hispanic kids learning English. Go figure. I actually think the dual immersion program should be Spanish and Mandarin. As you can see, a citizen showed up to protest the naming, and explained quite nicely why using Cavalier is not a good idea. He gave the history of the term and it’s meaning to the English and King Charles the 1st. Not only were Cavaliers English and from a different time period of the revolutionary war, it goes in the face of what Thomas Jefferson and our founding fathers stood for. That’s why when I was researching the mascot I rejected using Cavalier and Renegade instead. What makes this even more troubling and ironic is that school districts across the state said that they didn’t think graduating seniors should have to take a civics/citizenship test because civics were taught throughout K-12. Really? Didn’t anyone in administration or the teacher faculty have the common sense to tell the students that ‘Cavalier’ was probably inappropriate due to it’s ties to the British and they should come up with another mascot? If we are teaching civics, wouldn’t these students, teachers and administrators know enough not to use ‘cavalier’ as a mascot for a school named after a revolutionary man? This is why they had to hire a former shoe salesperson as an administrator to manage a whopping 24 students at the Avera Academy. The more ‘Know-It-Alls’ the better education our kids are getting, yeah right. 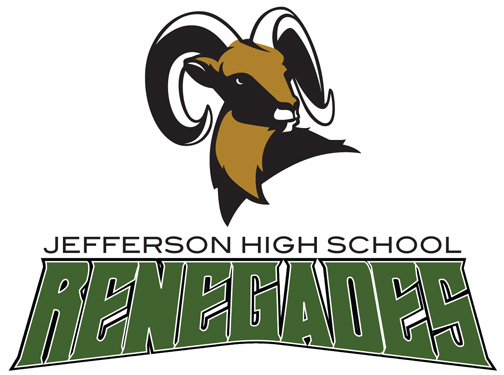 UPDATE: Jefferson High School Renegades? UPDATE: When I started working on this last night, I had NO idea the SFSD was going to announce today, I also had NO idea that they had already made a decision. So I was shocked when they made the announcement a few minutes ago. I guessed the colors dead on Gold and Green. While I also considered their mascot (Cavaliers) I didn’t want to pick it because it was too much of a blatant rip off, that didn’t stop the SFSD, which picked the Cavaliers. I also steered away from the Cavaliers because that is the Mascot of Bon Homme School district. As for Ben Reifel’s colors and Mascot, the students put a little more thought into it. They went with the Buffalo and Rosebud’s flag colors, Crimson Red and Gold. While I know NONE of my suggestions will ever be taken for the new mascot for JHS, I still thought I would take a stab at it. I have created well over 100 logos in my time as a graphic designer, including ‘tweaking’ some school mascots. I will warn you, this is a quick version of what I was thinking that I mostly took from clipart, etc. But I did do some research. I liked the Gold and Green color scheme. It doesn’t interfere with the other school colors and it represents diversity and strength. I like the Mountain Goat mascot (RAM) It represents Jefferson’s quiet, yet powerful strengths. I struggled with ‘Renegade’. It can have some negative connotations, but it defined our founding fathers who were fighting against a foreign power trying to control Americans. Besides only ONE person showing up to the School Board meeting to protest the new HS being named after Jefferson (because he was a slave owner) there was a presentation by Dr. Boysen on how the names were chosen. She talked about the super secret naming committee which consisted of 14 members (only 4 were named, apparently the other ten must be a part of the witness protection program). She proudly stated that two-thirds surveyed suggested Slavery HS but when it came to the suggestion of Ben Reifel she said ‘Someone’ suggested the name. So as I suspected, it was suggested by ONE person, and we have NO idea who it was. No surprise, typical of elitist school administrators who know better than us. So basically the middle school was named after the School District administrators with NO suggestions from the actual public. Was the $2 a month tax increase for school bond total BS? I just checked last year’s tax bill. It was $ 1164.57 for the year. Now, it is $ 1261.49. So, the increase for our modest home is $ 96.92 from ’17 to ’18. So where is that extra $ 16.75 coming from? I guess merely from an annual increase, which does not need opt out approval, huh? I also noticed that my 2017 tax bill acknowledges a $ 80.33 opt out cost, too, which is found within the $ 1164.57. So the $80.17 mentioned for 2018 does not include past opt outs. So what was suppose to be $24, or $30 in my case – based on the honest evaluation of my home – has somehow become $ 80.17. That $ 50.17 difference might not seem to be much, but how can $24 ,or $30, becoming $50.17 be true transparency? I looked at the value of my home and extrapolated for a $200K house. The tax increase for the opt-out for the school bond would actually be about $8 a month, NOT $2 a month. So if this is true, how did the $2 a month promise turn into 4 times that amount? Probably like how a hand tabulated election by the school district’s finance department got a 85% passage rate. 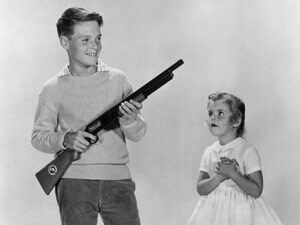 Why would you name a middle school after a gun? Another reason why a ‘public’ vetting needed to be done when selecting the names of the schools. Yet again the elitists with the school district seem to think they know better than the public. At least picking a mascot will be easy. 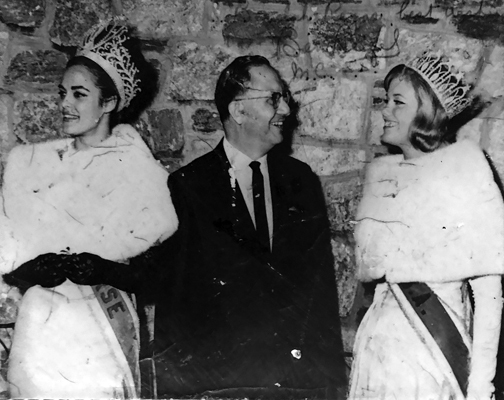 This is a signed photo I have of Ben Reifel with Ms. Universe (Greece) and Ms. South Dakota (not sure of the date). Oh, the irony of naming one school after a Native American and a slave owner who seduced one (or more) of his slaves. I will just let that go. It should NOT surprise us that they named the HS after Jefferson. That was a forgone conclusion. But while I like Reifel* as the choice for the Middle School, I would be curious how many people recommended the name. My guess is ONE. This is why the committee met in secret, and we only have the names of two of the members (School Board President Alberty and a Lakota student). We were told in the press conference that the committee consisted of 12 people, and two co-chairs, Dr. Boysen and Super Nold. The members were students, teachers, parents and administrators. No other names. I am still disappointed that the committee met in secret with secret members and no idea what the other suggestions were. If this was a private school, they could have done this all in secret, but since the SFSD is funded by taxpayers this process should have been in the open. Just like the school bond election, a total SHAM. *Ben Reifel served five terms as U.S. Congressman for South Dakota and is of Lakota Sioux descent. I bet if you asked 5 students or parents before the announcement they would have NO CLUE who Reifel was. He actually has an impeccable reputation of highest integrity. My guess is he would have been very disappointed in the naming process.